Enjoy confident grip in all cold-weather conditions. The winter tread compound maintains high grip levels at temperatures below 7 °C. The compound is long-wearing to give you extra mileage from your winter tires. Goodyear’s 3D BIS Technology® improves handling in unpredictable winter weather – from wet and dry roads, to ice, snow and slush. 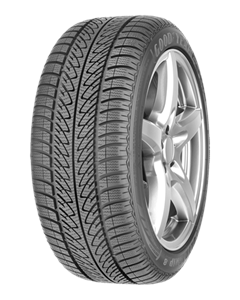 The optimized tire shape puts more rubber in contact with the road, increasing control in slippery conditions. The UltraGrip 8 maintains handling performance even as the tire wears, thanks to a next generation V-tread design. The UltraGrip 8 reduces the risk of aquaplaning on slushy or wet roads. A double V-groove – one groove for evacuating water and one for gripping snow – ensures good control in wet and thawing conditions. When tested against competitors' tires, the UltraGrip 8 offered 16% better resistance to aquaplaning on curved roads. Sorry, we currently do not have any tyres with the UltraGrip 8 Performance pattern in stock.